RLCS, Revista Latina de Comunicación Social, 73 – Pages 688 to 699 [Research] | DOI:10.4185/RLCS-2018-1276en | ISSN 1138-5820 | Year 2018 recognised case is The Diary of Anne Frank, a story that narrates how the Jews lived in hiding during the Nazi occupation of the Netherlands. In modern and postmodern societies, the sources of history are often mediated to be distributed by institutions. Photography, for example, is a mediation that includes a series of discourses to rebuild memory, as well as the Diary of Anne Frank which rebuilds what happened, in addition to being a social contribution to knowledge. González Callejas (2013) says that today’s society uses memory as a fetish of consumption to recover the past, i.e., mass culture takes advantage of memory through tourism, books and media products, such as cinema. González Callejas terms this consumption of the past as the “age of the collecting of memories”, a cult of marketing and exploitation of past behaviours. However, the author admits the commercialised and massive existence that involves the theme of nostalgia, where the current narrative has been able to take advantage of the rehabilitation of the histories of urban centres and records of everyday life through video, digital photography, documentaries, docudramas and websites. In his view, this is part of postmodernity, whose traces and images are stored to recall the past and generate an amplified function of memory. We cannot deny, then, that the review of the past is a matter of interest to the media that invoke it through documentaries, movies, television reports, radio shows, the internet and, currently, chats on social networks, as signs of reference to describe present situations. The media industry is characterised by its uniqueness when it comes to conditioning its functioning to convert content into something essential to audiences. This aspect is what leads the media, as managers of memories, to fulfil three fundamental functions: informative seduction, view of nostalgia and representation of the extreme. In this sense, in the words of Sánchez-Biosca, the visual medium “establishes and crystallises certain aspects of the collective memory, operating by selection between images, converting some of them into emblems of values, ideas, and by abstraction, stimulating different answers and diverse expectations” (2006: 14). Today, audiovisual communication, in all of its facets, has become the main matrix of memory. Themes on memory have been used to tell stories that represent a truth that occurred in the past. In this sense, Cinema, following the line of photography, was the main medium to record to inform, becoming at the same time, an evocation of it, independent of its laws and codes, completely different from the hermeneutic of history. Cinema’s images present sequences, stories, characters and the history of the multiplicity of events delivered by the past. For the study of cinema and its relationship with history, Garrido (2013) prefers to call it documents in video format. The historian argues that cinema in the field of memory opens up the senses of personal positionings due to the memory of individual experiences, as well as of discourses of public use. Another striking idea for the author is the recognition of the importance of television in terms of memory: “Television has become the main vehicle for the transmission of political and cultural ideas. Images penetrate the domestic sphere and exert an enormous influence on ideas, opinions, customs, and individual and collective memories” (Garrido, 2013: 30). RLCS, Revista Latina de Comunicación Social, 73 – Pages 688 to 699 [Research] | DOI:10.4185/RLCS-2018-1276en | ISSN 1138-5820 | Year 2018 the acts of characters and events within proximity variables so that the spectator can appeal to nostalgia, personal experiences, family situations and everyday-life events, according to popular culture. Thus, the narratives of fictional series that allude to memory have the singularity of being close, dominated by popular and domestic plots. In this way, historical fictional series contribute to the discourse of imagination that revitalises history as a narrative model in order to represent a certain period, marked by the postmodern disbelief which is unrecognisable in other media. In addition, it involves the localisation of a place that encompasses the universe of everyday life (narratives involving events of recent history) in which individuals’ historical processes and privileged areas are combined with the world. Regarding the incidence of viewers, “they recall their personal history, reminiscing how they lived the historic events of the 1960s and 1970s. For younger people, who were not yet born, the plots set in the political and social context of those years help them to better understand that historical period” (Pacheco, 2009: 226-227). In order for the text of this type of productions to be understood by viewers, its argumentation has to be expressive and referential. As Puyal (2006) points out, it works with the present, because it uses understandable winks to share certain social contexts of the moment. To the extent that the series with historical contents occupies an attractive narrative to be able to represent realism, it generates in the spectator a variety of emotions, identification and memories, which are elements that help approaching a social reality with the identity of a past. The obtaining of information provided by real-life events that are part of the narrative discourse can be considered, then, as an exercise of memory, understood as a desire to revisit the past from the logic of the present, through the evocation of a common imaginary. 4. Methods and techniques In order to recruit an ideal focus group to obtain positive results, we invited volunteers to come up to the universities of Valparaiso and Austral. The only criterion to select participants was that they had to be regular viewers of the series. Once the total number of participants was gathered, the characteristics of the session were informed to participants to generate confidence in the purpose of the study. The focus group technique was selected because the historical memory is part of a process of knowledge and, as such, participants’ perception is fundamental from a qualitative point of view, thanks to the experiences of a group of individuals, in this case the knowledge that TV viewers have of the fictional series. Participants were encouraged to reflect and talk about the contents of the series and its coherence with reality. To be precise, participants gathered in the cities of Valparaiso and Valdivia, specifically in the Extension and Communications Centre of the Universidad de Valparaiso and the School of Philosophy and Humanities of the University of Austral. 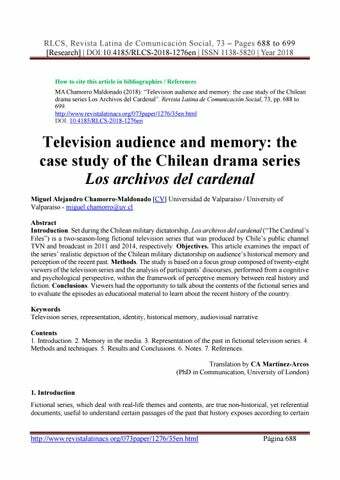 As mentioned, what participants had in common was that all of them were viewers of Los archivos del cardenal, so that, through in-depth dialogue, they could select and analyse representative elements of the discourse of the series, after watching 15 minutes of different scenes of the second season. The reasoning, as a report provided by the social actors, is used in the linguistic context for the social use of the results (Ibáñez, 1992). RLCS, Revista Latina de Comunicación Social, 73 – Pages 688 to 699 [Research] | DOI:10.4185/RLCS-2018-1276en | ISSN 1138-5820 | Year 2018 of the group as members of a society, with the social, political and cultural reference frameworks of Chile (Ibáñez, 1992; Callejo, 2001; González and Barrios, 2012). The cognitive properties have been chosen in relation to the narrative of the series, depending on the symbolic and cultural signs recognised by members of the group. All participants have many accumulated opinions and experiences as witnesses of the time under analysis and also know stories that have been transmitted to them by relatives in the case of the younger participants who were born after the 1980s but contributed to the country’s sensitivities, resulting from the portrait transmitted by fiction television. Viewers who were subjected to the test have a favourable opinion on the fictional series analysed as material to understand and revive the “historical memory” validated by the dramatisation of the story in the context of real-life events. Another evaluative reflection participants assign is the political memory and the recognition of experiences transmitted from parents or family members. Both the “archive images” and the “memories” are a recognition or reinforcement that comes to mind thanks to the resources used by the series (production props). However, an interesting finding is the concept of “imposition” which, for participants, reflects a system characteristic of that epoch, and so rather than living the stories told at a dramatic level, these images are part of Chile’s oppressive system in the 1980s. However, both groups from Valparaiso and Valdivia highlight the contents of the series as a tendency to rescue the themes linked to the audiovisual product in terms of dramatic quality, as well as their contribution to revalorise the history of the country. For participants, the material provided by the series is a contribution to the “knowledge of the new generations who were not born yet during the period addressed” (highly valued topic). An important element identified throughout the intervention is fear and emotion, which are transversal to the attributes of “historical memory”, “archival images” and “memories”. In other words, they are characteristic conditions of the dramatic dimension of the series in the social and political representations which are combined with the sentiment of those members of the group who remembered or felt what they experienced when they were younger. Participants recognised that the series provokes an emotional affection and that the fear is present in the memories after recognising the political and aggressive character of the time. The identification with pain and fear is triggered by specific images of the series, such as scenes of shootings, torture and persecution. For participants over the age of 40, who witnessed the events that occurred in the 1980s, more than one image made them remember the experiences lived by themselves and acquaintances, which in turn provoked certain emotions or states of affliction. Adults, who witnessed the events that took place during that time, confessed to remember fear. In this sense, we can point out that this is a behavioural conditioning, a basic emotion that is coherent with the time they lived, i.e., the series’ strong images of torture and persecutions triggered the recognition of the fear experienced during the dictatorship, which is a sensitive and delicate issue for the Chilean society. This is confirmed by some of the focus group participants: Víctor Peñaloza: “There was a very important fear that is plotted here, with the shootings, people running, that perceptible fear in all the people, that is the memory that comes to me the most”. RLCS, Revista Latina de Comunicación Social, 73 – Pages 688 to 699 [Research] | DOI:10.4185/RLCS-2018-1276en | ISSN 1138-5820 | Year 2018 Brenda Martínez: “It got me down because it is very close to me, i.e., I feel the stories of the CNI , I remains inside of me; this type of series makes me feel sad because they reflect what I experienced in the flesh”. Fernando Valdés: “I feel depressed, I feel down, I’m very shocked because I, for example, was also 12 years old and I was detained for playing with a wave in the street when the curfew was at 3, when suddenly one went to the corner, when I was a teen, and you caught by the police [...] I was 13 years and at that age you could already be considered an extremist by the cops of that time. Then, I remember that was in the house and in the curfew in Valparaiso nobody was in the streets, there was an absolute silence. Then if they knocked at your door at 3 or 4 in the afternoon, it meant there was a problem; they did not knock the door but rather banged it. It was either the police or security guards [...] This makes me feel afraid, lots of fear at that stage, fear of the street, fear of seeing the disturbance. That’s it more than anything. It was a childhood in which going outside the house had to be controlled, because the time to go out was limited, they limited your space, they limited your time. It was not the same life: you could have family freedom but not public freedom”. 6. Notes 1. See Duch and Chillón (2012), Un ser de mediaciones. Antropología de la Comunicación (“A being of mediations. Anthropology of Communication”), on the references of Jan Assmann, p. 414, who gives a pedagogical vision on the cultural memory derived from external dimensions, understanding culture as a broad process of comprehension. 2. Common in this type of transmissions are the stories told by grandparents about popular celebrations and religious festivities, which churches turn into true traditions, such as the Holy Week and the Assumption of the Virgin, among other festivities. 3. CNI stands for Central Nacional de Informaciones, which is the National Information Centre that operated in Chile during the military dictatorship. Article received on 23 December 2017. Accepted on 27 March. Published on 5 April 2018.